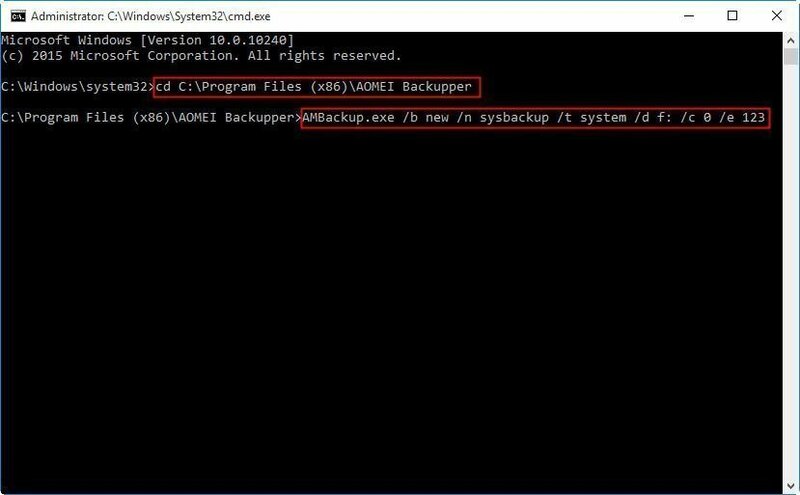 Use Wbadmin start backup backuptarget command line to specify various locations including critical volume, shared folder over network as backup target in Windows 10/8.1/8/7 and Windows Server 2008/2008 R2/2012/2012 R2. Where can be set as backup target drive? When specifying local disk or volume using its drive letter or GUID-based path as the WBadmin backup target volume, you cannot select any volumes included in the backup. When specifying a backup to shared folder, bear in mind that the next backup will overwrite the previous one before even starting. Therefore there is a risk that you may lose all the backups if the running backup fails. Seemingly, configuring a backup using Wbadmin has many restrictions and limitations. Luckily, some of them, there are solutions or workarounds to get over with. 1. Backup to critical volumes. When saving backup to your local disk, there are chances that you gets an error message saying that the location for backup is a critical volume or something similar. Windows backup utility won’t allow you to backup to critical volumes, but you can get over with this by modifying some lines in Registry to allow Windows to backup to critical volumes. Modifying tings in the registry incorrectly may lead to serious status. This is not recommended unless you strongly need to save backups to critical volumes. Example: SCHTASKS/Create/SCDAILY/TN DailySystemBackup/RL HIGHEST /ST 00:00 /TR "WBADMIN START BACKUP -backupTarget:\\192.168.0.221/Public/Schedule -allcritical -include:systemstate -quiet >> C:\backupLogs.txt"
3. Create incremental backup to network share. To do this, you need make Windows think the shared folder as a local disk, so Windows won’t overwrite the original backup. You can create a virtual hard disk (VHD) in the shared location and initialize and format with NTFS. Then you can set this new created VHD as backup target location to run incremental backup. Note: Windows only supports keeping one scheduled backup, and the scheduled backup will fail if there is a backup running when the scheduled time comes. If you do not content with these workarounds, you can try the third party software. AOMEI Backupper (AB) is a Windows backup program that doesn’t have the limitations of the locations to save the backup. It allows you to backup to local disks, External disks, solid-state drive (SSD), USB flash drives, thumb drives, CD/DVD, network-attached storage (NAS), hardware RAID, dynamic disks and virtual machine system from command line as well as graphic users interface (GUI). You can keep multiple scheduled backup tasks and all versions of backup can be saved as you wish. Providing 4 editions, which are AB Standard, AB Professional, AB Server, and AB Technician, AOMEI Backupper will be your best backup solution no matter whether you are running a PC or a Server. 1. Download and install AOMEI Backupper. 2. Open command prompt with administrator rights. 3. Type in the installation directory path of AOMEI Backupper and press Enter. 4. Run a command to create the backup task you want. Compared with AOMEI Backupper, the wbadmin start backup backuptarget switch is a bit of cumbersome when specifying a target location. Besides backup and restore, you can use AOMEI Backupper to clone hard drive or only OS from command line. Click here to see all the parameters of AOMEI Backupper command line utility.